Posted on October 25, 2009 at 7:30 am. THANK YOU! Merci! Maraming Salamat! Selamat! Muchos Gracias! How many words more can I express my gratitude to all the people who read this blog and inspired me to go on writing chronicles of my journeys? At the First Nuffnang Asia-Pacific Regional Blog Awards held recently on October 23, 2009 in Pan Pacific Grand Ballroom in Singapore, Ironwulf.net :En Route bagged the award as the Best Travel Blog in Asia-Pacific. Wow! 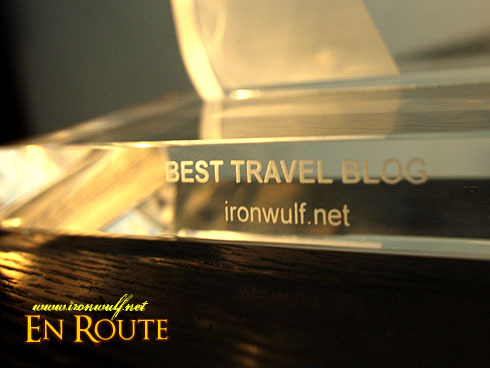 I still can’t believe that Ironwulf.net bagged the Best Travel Blog since I wasn’t really expecting it. In fact we were asked to prepare a speech a few days before but I didn’t really bother to write since I don’t want to expect anything. Competition was really stiff with Malaysian Travel Bloggers like Akademi Fantasia and Nicole Kiss and Singaporean Travel bloggers like Eunice of TravelerFolio and the tandem of Zhiqiang and Tingyi of Passportchop. I think among the finalist I’m the only one who hasn’t really broken through Asia and really gone around the globe. But it was great to meet these guys at the dinner table. Eunice is a common friend of DongHo. Zhiqiang and Tingyi were great to talk with along with Akademi Fantasia. Nicole is fab and fashionable as I saw her in her blog. It was a pleasure to dine with them and I share this award with each of them who are winners in their own right. I was damn nervous at the stage that I wasn’t able to thank formally the people I wanted to thank. So let this be my “thank you speech”. Thank you to my family who supports me on all my travels, my friends for the support and believing in my capabilities, and travel buddies who share stories of my travel. 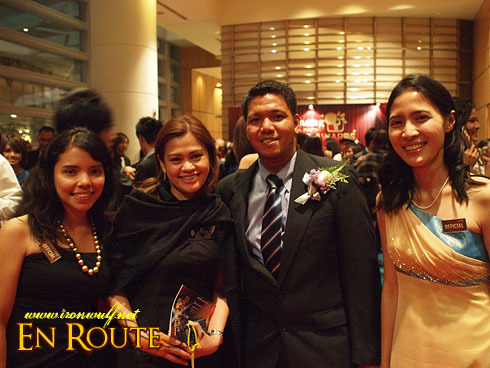 The fellow Filipino finalist and the other bloggers present at the awards night for rooting for us. Thanks god there are two Filipinos who made it. 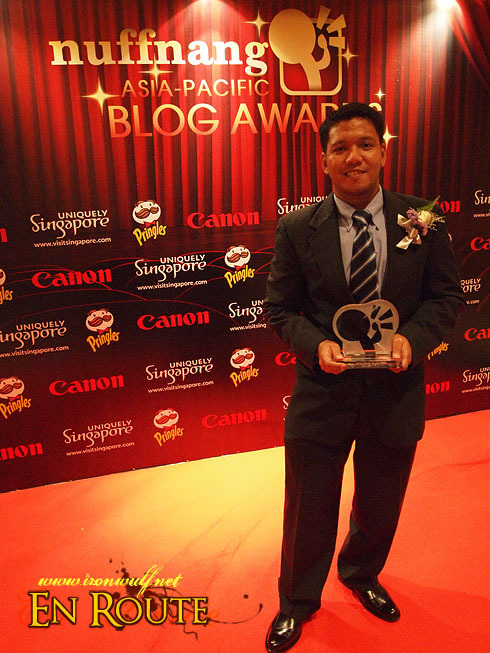 Kudos to Arnold of Mr Gadget as well for bagging the Best Gadget Blog Awards. He’s also a Filipino based in Australia. Too bad I wasn’t able to shake your hands personally. And of course to Nuffnang for bringing more than 300 bloggers across Asia together in one event, Pringles, Canon and Uniquely Singapore for being the host country this year. Of course big thanks to the duo Ming and Tim for founding Nuffnang and escalating blogging to this scale. I never really expected this event to be so big until I saw all of the bloggers in all their glitz and glamour in one setting. Being a black tie event and walking on red carpet made this event really elegant. We learned that there were around 10,000 nominated blogs and it’s such a feat to be able to trim them down to 60 in number. The food at Pan Pacific was also good, I loved the Tartare and the dessert. The awarding ceremony was straightforward and entertaining. Allan Wu was a great host. I liked how they we spread out the dinner across the awarding announcement with a few entertainment in between. XiaXue and Kenny Sia were a real riot. But I think the grand winner of the night was XiaXue as she got 3 awards – The Most Influential, Best Blog Design and the main award Region’s Best Blog. Everyone was so busy after the awards that I didn’t get to have my picture taken with XiaXue. Not to extend this speech any longer. Let me cap off this post with one big grand THANK YOU! Hi Fredz!!! Nice post abt the event! U still in SG? Hope u enjoy your stay! Congratz once again!!! hope to c u again… well well perhaps when we come to your country in the near future!!! U must tour us around!!! Take care!!! Congratulations! You richly deserve it, in part because you focus on Asia! Congrats Ferdz! you look sharp. Cheers! Hi Eunice! Will be leaving later SG later. I enjoyed my weeklong stay here. Sure. If you’re visiting Manila, just drop in a line, will be glad to tour you around. congrats! i doubt have second thought na ikaw mananalo dyan. galing galing talaga! Congratulations amigo 😀 You deserve the award naman talaga. Continue being an inspiration for all of us 🙂 God bless you my friend! Congrats bro, mabuhay ang Pilipinas! hi, it’s my first time here but I was entertained by your post. You deserve the award. Congrats! again congratulations ferdz! dadami ang mga fans kasama na galing sa ibang bansa. kakatuwang makita si eunice. Congrats for winning the Best Travel Award from Nuffnang. Keep up the great work. Ferdz, congrats!! Hope you’ve enjoyed your short stay in Singapore and its a great pleasure knowing you too! Congratulations! and your success is soaring high, more powers and God bless! Hi Ajay! Salamat and more travels to you too! Hi Zhiqiang! Nice to see you here. Hope to see you guys in Singapore when I go back there. Hi David! Am glad to have met you there as well. Hi Tingyi! Glad to see you here. I enjoyed my 11 day stay in Singapore. Thanks you very much Andrea! congratulations. you are in the big leagues my friend. tsaka ang gaganda ng mga kasama mo sa pic. wow! huge awards keep on coming… Congratulations! Congrats! 🙂 I just stumbled upon your blog a few weeks ago and am loving it! Especially your photos, v nice. Congratulations again, Ferdz! You truly deserve it!!! Before the awarding starts, we already have a good feeling that you will bag the Nuffnang Best Travel Blog award! Thanks Huzaifah! Glad to have met you there too! heyyaa! 🙂 congrats on ur win yea? i love ur header btw hehe. 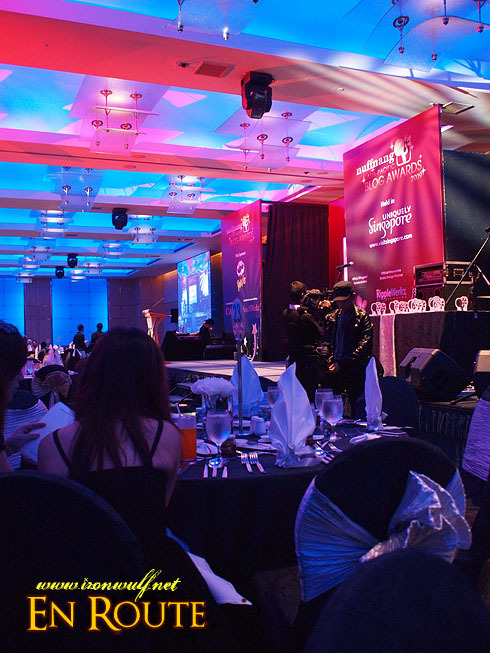 oh just to inform u, if u wanna see ur on-stage moment when u were receiving ur award, it’s on my blog already. I video-ed your acceptance speech 🙂 congrats again! congratss! for winning the best travel blog award! hope to see you at the 2010 award again. good luck and all the best! congrats sa mga pinoy na nanalo..we are so proud guys..